Microgaming has created a video slot that will appeal to anyone that prefers spending most of their spare time at home. If you love watching a movie, soap operas or playing video games more than outdoor activities, means you have traces of habits of a Couch Potato. This is the very name of the online slot machine by Microgaming which has 3 reels and 1 payline. Read on to learn a bit more about this video slot. The video slot comes with 1 payline and 3 reels in true land-based slot machine style. Like most of the older slots, the backdrop of this slots game is covered by large reels. Now, it literally has a potato that lounges on top of the reels. The symbols on the reels are typical familiar symbols that all slot players should be used to. These symbols include single-double-triple bars, yellow-blue-white sevens and cherries. 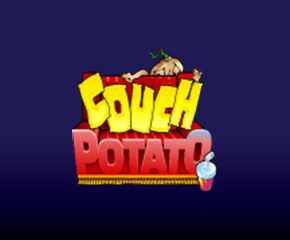 The Couch Potato is the highest paying symbol rewarding players 15,000 coins. This symbol also acts as the Wild symbol in this slot. Land 1 or 2 of this symbol in a combo win and you will earn a multiplier of between 5x and 25x. You can land wins with mixed symbols like mixed bars and sevens. A combo win is also possible with 1 or 2 cherry symbols. The first step you need to take in playing Couch Potato is to place your bets. The minimum bet allowed for each spin is £1 while the maximum bet allowed is £600. Once you have placed your bet, select the number of coins you intend to use which will either double or triple your betting value. Where you are having difficulty setting your coin value, you can click on the “Credit” icon which will transform it into “Coins”. You can now change the coin value. 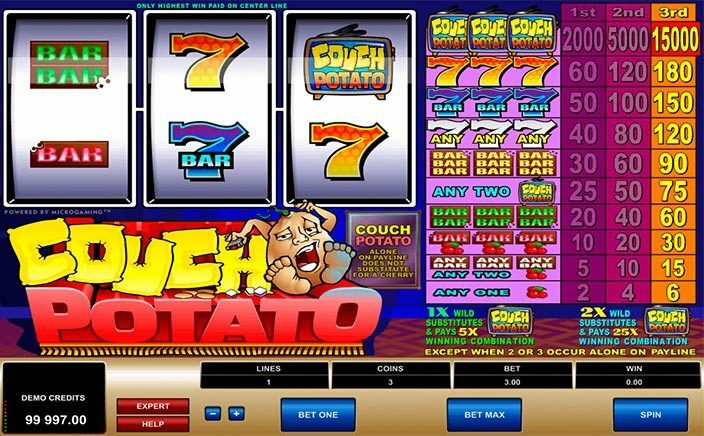 By landing a minimum of 3 Couch Potato logo symbols when you select between 2 and 3 coins, you will boost your staked sum by either 2x or 3x. For one the jackpot will rise from 2000x to 5000x and finally to a maximum of 15000x. The more coins you select the higher your jackpot return. This is a simple classic-styled video slot with basic graphics. The sound is nothing spectacular, same as the animation. This is a video slot that has a high volatility and an RTP to the tune of 97.43%.